The mission of ETHAC is to mobilise knowledge and innovation transfer to the global market by enabling international triple helix interactions where academics, innovators, industry, entrepreneurs, investors, governments and policy makers actively engage in innovation co-production and transfer. The sustained political and media focus on movements of people across the Mediterranean Sea, which peaked in 2015, has moved on. However, the people who moved remain in Europe - and the medium and long term issues of managing diversity are only just beginning to be addressed. What is life like now for those who moved a few years ago and remain in precarious living settings with insecure immigration status? How are local organizations and institutions, in the places where numbers of recent international incomers peaked in 2015-2016, moving on from the crisis of arrival to longer term questions of integration and settlement? And what are the long terms implications for a ‘new’ European politics of the language of migration crisis, given the rise in populism and far-right political movements across many European countries? The University of Sheffield International Faculty, CITY College, and its research centre, SEERC, celebrate academic research with the Young Researchers Week 2019, taking place in Thessaloniki, 13-17 May 2019. The event will provide an opportunity for university students and academics to present their work to a wide audience, thus making possible the interaction with lecturers, professors and researchers. The Week consists of two conferences and satellite events, more information on which you may find below and in upcoming weeks. For now, save the date! 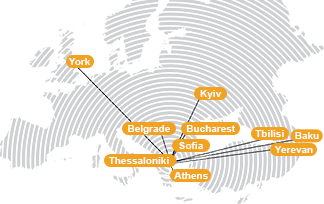 The South East European Research Centre invites applications for studying towards a PhD degree of the University of Sheffield, through the Doctoral Programme of SEERC. The deadline for applying is May 3, 2019. On 12th February 2019 in Brussels, partners of the iStart project as well as many outside guests, university students and other stakeholders got together for the 7th and final iStart Multiplier Event at the Université libre de Bruxelles (ULB) premises to look back on the 30 months of the project, which is coming to a close at the end of February 2019. Prof. Panayiotis Ketikidis, Vice Principal for Research and Innovation at the International Faculty CITY College has been invited to be among the members of the Judging Committee of the Education Leaders Awards 2019. Organised for the 4th consecutive year, the event aims at evaluating and rewarding educational activities undertaken by educational organisations and institutions in Greece. Prof. Panayiotis Ketikidis, Vice Principal for Research and Innovation at the International Faculty CITY College has been invited to participate as speaker in the World Business Angels Investment Forum 2019 which will take place 17-29 February 2019 in Istanbul. E-PROTECT Σεμινάριο:"Ζητήματα ανήλικης θυματοποίησης και προεκτάσεις στην ποινική διαδικασία"
Το Κέντρο Ερευνών Νοτιοανατολικής Ευρώπης SEERC, στο πλαίσιο του ερευνητικού έργου "E-PROTECT" που υλοποιείται υπό την χρηματοδότηση του Προγράμματος Δικαιοσύνης της Ευρωπαϊκής 'Ενωσης, διοργανώνει επιμορφωτικό σεμινάριο με θέμα "Ζητήματα ανήλικης θυματοποίησης και προεκτάσεις στην ποινική διαδικασία" Προσέγγιση, αξιολόγηση αναγκών, διαχείριση περιπτώσεων.